Yes, and it will get balanced. I'll be dropping off the flywheel and PP soon. Pistons will be JE/Wiseco (same parent company now, it seems). I intend to get a wideband set up even prior to going with EFI, so that should help with tuning the CIS. Yes JE and Weisco are under the same umbrella. Weisco makes a better product I think. They actually put a coating on the piston skits for break in. The wideband will help you tune the CiS but it's not advisable to keep a wideband active with CIS running in factory form. The Bosch 4.9 and newer sensor will burn out in a month due to the insane rich lean swings of CIS. The older Bosch 4.2 hold up better but not by much. The NTK L1H1 sensor would be ideal but no one supports this due to cost being double of the Bosch. So use it for tuning then remove it, Don't leave it hooked up. I burned out 3 sensors mapping the factory ECE CiS to get an understanding on the fuel side. This was research in preparation for FrankenCIS switch. @70.00 each sensor that was not money well spent. Just went to pick up the assembled bottom end from the machine shop. I checked it out and the pistons they ordered up from Wiseco do NOT guide the rod. Am I correct that the rods in the 102.983 motor are piston-guided? If so, is there any documentation that supports it that I can present to the machine shop? this engine are guided at the crank pins." So now i'm just confused. Last edited by 3f05q; 06-22-2018 at 01:15 PM. early engines are crank guided, later engines are piston guided. Do you know the engine number cutoff for the change? Last edited by 3f05q; 06-22-2018 at 03:00 PM. This motor has been at the machine shop for a full year now. What are the thoughts on machining up brass/bronze bushings for the wristpin to take up the space? Is the thrust distance a known spec? This is why manufacturers should not be so stingy with part numbers. If the crank, rods and pistons are different, you got a different engine that requires a different number. I'll guess MBZ cut this corner to avoid re-certification. And I'll guess it was not MBZ Germany but rather North America. Fire your shop for taking so long. If you can't do that, at least take them out of the loop between you and Wiseco. If I'm following this correctly you have a later crank and rod. Are the Wiseco pistons early pistons with a 24mm bore, in which case, how was the engine assembled? Are the pistons 22mm bore but with a bottom side gap greatly exceeding the Mahle design which is roughly 22.1mm? If they didn't follow the pattern given them, then it should be a no cost redo on them. I doubt I can take that kind of action at this point, and I'm trying to involve myself now as much as possible. Everything I see online, while limited, says Wiseco doesn't have a casting that's narrow enough in this area, but JE does. If I'm stuck with these pistons, what are the thoughts on bronze spacers to take up the space? using spacers should be ok, common practice there. do your rods have edm oiling hole through them? using spacers should be ok, common practice there. Good to know. how much total clearance should there be? do your rods have edm oiling hole through them? I don't know. Do all factory rods have them? Would that affect decisions as far as how the spacers are made? Your rods are rifle drilled, and its not relevant, and it may not have been accomplished by drilling. "edm" is a term used for push rods if its used at all. Here's the situation with a factory piston. 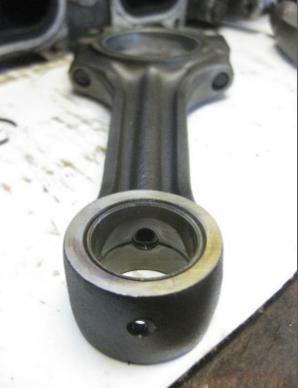 Piston and pin are free to swivel/rotate. I was taught that the oiling hole is called edm, if that's not the terminology these days, you still understand what I mean. That is how the pin gets oiled and the piston gets cooled, if you have alternate rods, you may need oil squirters to do the same job. If using oem rods, you won't have to worry about that. I have some spacer'd 16v piston setups around that I can post for example. ...and nearly a month later the decision has been made to have JE make spacers. I CC'd the head and got 55cc across the board. I called the machine shop and got the part number of the piston: ASC-00347. I called Wiseco to see if we would be close to the requested 10.5:1 CR and the helpful rep looked up all the specs and we came to a calculated CR of 10.2:1 with the only assumption being a .042" head gasket thickness (Gasket thickness is something we both found by searching the interwebs, but now I have doubts about that number). Not what I asked for. SO... what is the factory crushed head gasket thickness? If I go to, say, .032" thick, that takes me to 10.5:1 and I could theoretically go up from there. Any recommendations for a custom thickness headgasket? ...also just realizing that I don't REALLY know the piston/deck clearance. Last edited by 3f05q; 07-27-2018 at 01:12 PM. I used aluminum spacers for my cosworth pistons... i figured out piston is aluminum so should be ok to use aluminum as spacers. You're out of luck, if i remember right, stock gasket is closer to 1.5mm. 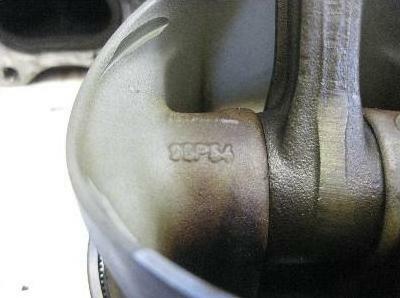 This is why you can allow the pistons to stick out of the bores a little to get a good squish. Last edited by The Benz Master; 07-30-2018 at 06:50 PM. i have a crushed gasket i can measure. If the shop was using a stock piston for crown height, your math will end up at around 10.2. To get to the quoted 10.5, you would have had to deviate from the factory design. Also, tossing in thermal expansion coefficients for aluminum will make you happier. i measured the crushed cylinder rings on the headgasket to be 1.75mm. the gasket material to be 1.70mm. this headgasket is a goetze.